Caitlyn Jenner, formerly Bruce, wants to be called "her," not "him." Most journalists are respecting her preference, but the reaction is certainly not universal or uncontroversial. Jenner's very public transformation is calling attention to something activists call misgendering. They say that when news anchors and commentators purposefully use a male pronoun for Jenner, such as "he," they are misgendering her, thereby insulting her and the transgender community more broadly. After all, Jenner's Vanity Fair cover was very clear. "Call me Caitlyn," it said, formally signaling Jenner's pronoun preference. And the National Center for Transgender Equality's advice is equally clear. "Use the name and pronoun the subject prefers," its tip sheet for journalists says. News outlets are generally striving to be sensitive. Many journalists immediately adopted "she" and "her" in articles and discussions. The same is true of many commenters on Twitter and Facebook. But others are saying "he" -- some simply inadvertently, others as a way to tacitly reject Jenner's gender transition. Jenner's 89-year-old mother Esther told the New York Daily News that she'll switch from Bruce to Caitlyn, but it'll be difficult because "it's habit." Difficult, indeed. Sometimes -- and I'm writing from personal on-air experience here -- TV anchors and commentators are saying "he" and "she" in the very same sentence. On CNN's "New Day" on Tuesday, co-anchors Alisyn Camerota and Chris Cuomo expressed sympathy and support for Jenner while using male pronouns. "I think it's startling to see him as Caitlyn," Camerota said. "It's fascinating. I want to see more." Some journalists, feeling they need to specify who they're talking about, are using the name Bruce, particularly when speaking about the past. Vanity Fair writer Buzz Bissinger, who spent hundreds of hours with Jenner for a 22-page profile, used "Bruce" and "he" while referring to Jenner's life before facial-feminization surgery, and Caitlyn and "she" for everything after the surgery. There's actually an acronym for this, PGP, short for "preferred gender pronoun." The language issue is well known to transgender individuals and advocacy groups. But many other people are learning about it for the first time now that Jenner's gender transition is international news. Anticipating widespread coverage, the advocacy group GLAAD recirculated its guidelines for referring to transgender individuals on Monday. The guidelines say in part, "DO use female pronouns (she, her, hers) when referring to Caitlyn Jenner. DO avoid male pronouns and Caitlyn's prior name." Many big news organizations go by similar guidelines. For example, the CNN stylebook directs journalists to go with the preference of the person, and when there's no specific preference known, to go with whatever pronoun is consistent with how the person lives in public. Perhaps Jenner's transition is complex because it is happening so publicly, and in stages. In April, when Jenner first spoke about being transgender to ABC's Diane Sawyer, I said there was a "pronoun dilemma" for news outlets, since Jenner wanted people to continue saying "he" for the time being. Yet some on television conspicuously said "he" in the coverage after the Vanity Fair cover's release. "Now he's a cover girl. ... Now he's Caitlyn," Bill O'Reilly commented on his Fox News program Monday night. "I give him a lot of credit," O'Reilly's guest, Fox colleague Megyn Kelly, said. "I think he's courageous." O'Reilly added that he believes transgender individuals should never be bullied. Critics of Fox pounced on another exchange, from the Fox Business Network, where anchor Neil Cavuto acted uncomfortable about the Jenner news. Joslyn DeFreece, a transgender actress, said in an interview on CNN International that when people are confused about a person's gender, "it's about going to the person and asking them what they identify as." Transgender individuals are "rightfully sensitive about the use of language," Bissinger wrote in Vanity Fair. Still, he found himself calling Jenner "he" and ended some conversations by saying "All right, man, I'll talk to you soon." He wrote, "My miscues have nothing to do with intolerance ... but because it is a strange story regardless of all the important inroads that have been made by transgender men and women into the cultural mainstream." Further highlighting the issue, an anonymous Twitter account even popped up on Monday afternoon, shortly after the cover was released, to correct tweeters who refer to Jenner as a man. 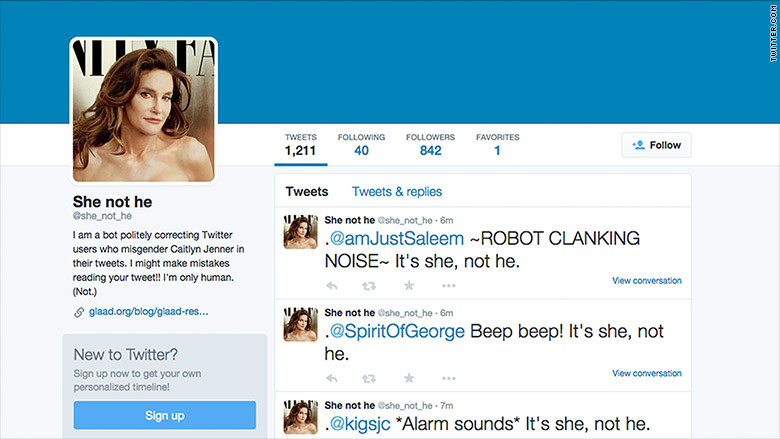 "I am a bot politely correcting Twitter users who misgender Caitlyn Jenner in their tweets," the account says. On Tuesday Washington Post blogger Caitlin Dewey identified herself as the creator of the bot. She said she found some "irredeemable, stomach-turning transphobic folks" but also some polite, apologetic people. "Maybe compromise and dialog are possible on the Internet," Dewey wrote. Perhaps the conversation about Jenner and misgendering will have a wider impact. As one tweeter, Lauryn, wrote, "I hope everyone who is correcting people who misgender caitlyn jenner will do the same for non famous trans people."